Home CALENDAR of EVENTS Bourbon and Beyond Culinary Lineup Announced! We’ve been waiting on the edge of our seats to see who will be serving up the culinary experiences at the Bourbon and Beyond Festival at Champions Park in Louisville September 22 and 23, and we’re thrilled to finally see and share the list. Decca’s Annie Pettry will be teaming up with New York and Washington D.C. chef – and Louisville native – Akhtar Nawab to demonstrate best-of-the-bluegrass dishes. Milkwood’s Kevin Ashworth joins Cincinnati chef Jose Salazar to show why a great steak pairs better with bourbon instead of red wine. Festival bourbon curator Fred Minnick partners with Top Chef head judge Tom Colicchio to discuss the chemistry of good food and drink – how the chemical transformation of bourbon in the barrel mirrors the techniques of food in the pan. Various musicians performing at the festival will also get a chance to show off their culinary prowess. Look for more details to be announced in the coming weeks. 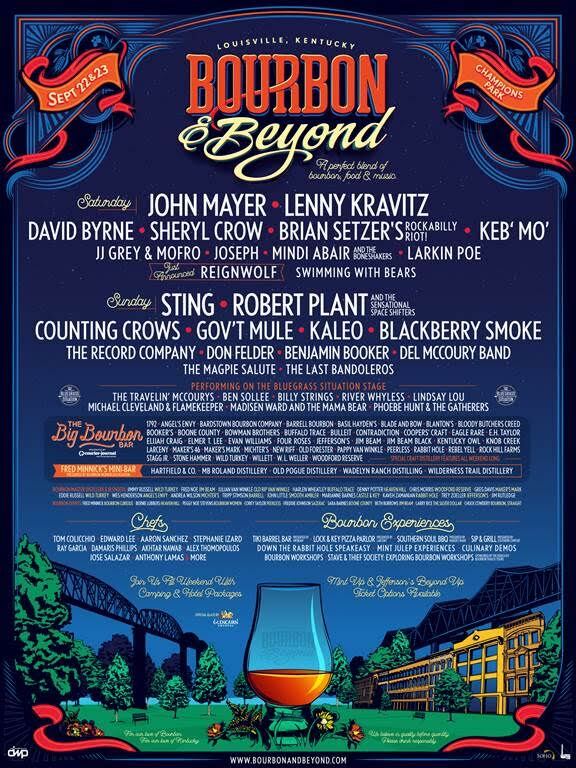 Live music sets at the festival include Sting, Robert Plant & The Sensational Space Shifters, John Mayer, Lenny Kravitz, Counting Crows, David Byrne, plus dozens more, as well as 30 bourbon and food-focused experiences. If you want to pregame with some great expeirences, you can check out exclusive distillery excursions from Mint Julep Experiences including Blade & Bow, Bulleit, Jefferson’s Reserve, Jeptha Creed, Kentucky Artisan, Limestone Branch, Maker’s Mark and Wild Turkey. Bourbon & Beyond is also partnering with the Muhammad Ali Center, which will host the Friday Night Supper Club in addition to offering festival ticket packages with special museum admission pricing and opportunities to attend the nationally recognized Muhammad Ali Humanitarian Awards. Bourbon & Beyond Presents: St. Paul & The Broken Bones | Iroquois Amphitheater | 8 p.m.